Jon Gosselin and ex-girlfriend Hailey Glassman continue to fling accusations at each other. (PEOPLE.com) -- In the aftermath of the alleged ransacking of the Manhattan apartment they shared, Jon Gosselin and ex-girlfriend Hailey Glassman continue to fling accusations at each other -- via their lawyers. 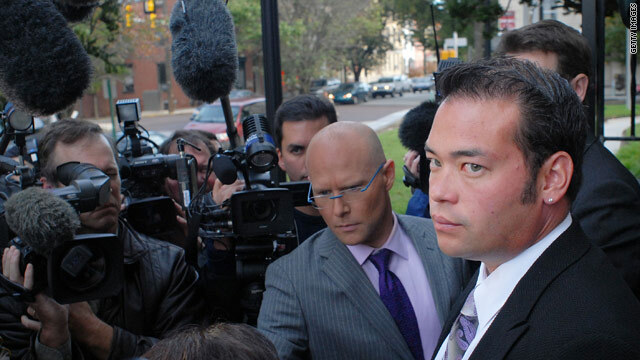 On Monday, Gosselin's attorney Mark Jay Heller told RadarOnline.com, "Hailey Glassman is going to jail, it's as simple as that." Now Glassman's camp -- who called the incident a publicity stunt -- is firing back. "For an attorney to go out there and say someone's going to jail when they're not even arrested -- that's just irresponsible," Glassman' lawyer Stephanie Ovadia tells PEOPLE. "That is the most ludicrous, ridiculous, unnecessary statement I have ever in my life heard." Of the investigation into the apartment trashing, Ovadia says, "All the police have done so far is fact-finding. They're trying to figure out what occurred here -- if anything -- other than two people who were living together breaking up." Ovadia confirms that both Glassman and her mother have met with officers from the NYPD to discuss the incident. According to her camp, Glassman did take items from the apartment, on which she split the rent with Gosselin -- but everything she took belonged to her. Gosselin "told her the apartment would be padlocked because he had not been paying rent, and she should go there and take whatever she wanted," Ovadia tells PEOPLE. Asked about the fingerprint and handwriting analysis that Gosselin's lawyer has claimed is being conducted on the note Glassman is accused of spearing into Gosselin's dresser with a butcher knife, Ovadia says: "I don't believe there's anything to be concerned about. And I don't know of any notes. Again, I know nothing about any butcher knife. I can't even add to that nonsense." © 2011 People and Time Inc. All rights reserved.